A rescue ship stranded in the Mediterranean with more than 200 migrants on board will finally dock in Malta, Italy said Tuesday, as EU states remained at loggerheads over how to handle the influx of people trying to reach the continent. The German charity vessel Lifeline rescued the 234 migrants, including children and pregnant women, on Thursday but Malta and Italy initially refused to take it in. 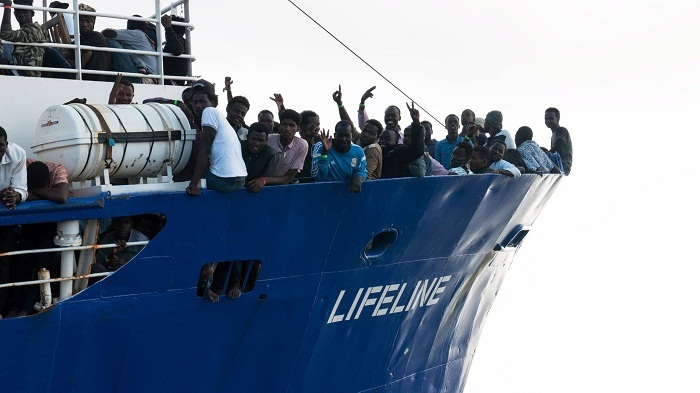 "I just got off the phone with (Maltese) Prime Minister (Joseph) Muscat: the NGO ship Lifeline will dock in Malta," Prime Minister Giuseppe Conte said, without specifying when. "Italy will do its part and welcome some of the migrants who are on board the Lifeline," Conte said. He expressed hope "other European countries would do the same", but did not reveal how many migrants Italy would take. French government spokesman Benjamin Griveaux earlier told RTL radio that "a European solution seems to be emerging". A spokesman for the Maltese government had added: "There are ongoing discussions among a number of EU member states to take a share of the migrants." The decision by Italy's new populist government and Malta to turn away migrant rescue vessels has plunged Europe into a political crisis over how to collectively handle the hundreds of people fleeing war and misery in Africa, the Middle East and Asia. Griveaux insisted there was no migrant "crisis" but urged leaders "to respond quickly to an urgent situation". "France is ready to send a team on site to process (asylum) requests on a case-by-case basis," as it did for migrants aboard the Aquarius once it docked in Spain after also being spurned by Italy and Malta. Spanish Prime Minister Pedro Sanchez said Madrid would take part in a "joint response" over Lifeline, but "several countries must participate". "Spain is united, a country of solidarity, as we have shown with the Aquarius," he said. Nationalist Corsica leader Jean-Guy Talamoni said Monday it was "ready to help" but that it needed the agreement of French state. Italy's far-right Interior Minister Matteo Salvini -- who has vowed an uncompromising stance on the issue -- paid a surprise visit on Monday to Libya. He called for processing centres to be set up in various unnamed African countries to deal with potential migrants in a move "to help Libya as well as Italy block migration". Similarly, France has proposed setting up EU asylum processing centres in Africa aimed at discouraging people to attempt dangerous trips. Libya is a key departure point for thousands of refugees and migrants hoping to reach Europe, although hundreds drown each year attempting the perilous crossing over the Mediterranean in often rickety boats. Its coastguard said it had rescued nearly 1,000 people on Sunday, and Spanish authorities said they had picked up more than 600 others on Monday. Salvini's visit came a day after emergency talks in Brussels between 16 EU leaders in a bid to break a longstanding deadlock over who should take in the migrants, the bulk of whom have been landing in Italy and Greece. A full summit is scheduled for Thursday and Friday. EU Migration Commissioner Dimitris Avramopoulos on Monday urged European nations to work together, saying: "It's a moment of great responsibility." EU deals with Turkey and Libya, the main transit countries, have sharply cut, at least for now, the flow of migrants to Europe since a 2015 peak of over one million. The current row came to a head earlier this month when Italy's new populist government turned away the Aquarius with 630 people on board. Salvini warned foreign charities to stop rescuing migrants off Libya, accusing them of "causing trouble" and saying Italian ports "are and will be closed to those who aid human traffickers". The war of words saw French President Emmanuel Macron accuse Rome of "irresponsibility" for turning away the boats, while Italy denounced Paris for hypocrisy in pushing migrants back across their shared border. The issue was raised during a meeting at the Vatican Tuesday between Macron and Pope Francis, who has called for "solidarity" with migrants. Giving a bronze medal to Macron, the Pope said it was the "vocation of those in government to protect the poorest". In Germany, Chancellor Angela Merkel is facing an ultimatum from her hardline interior minister who has given her until the end of June to find a European deal to curb new arrivals.